Today our special guest is Michael Helms, He has a PhD and MBA. This is one interview of many showcasing the dedicated men and women who have fallen in love with the work that the Cheetah Conservation Fund in Namibia is doing. 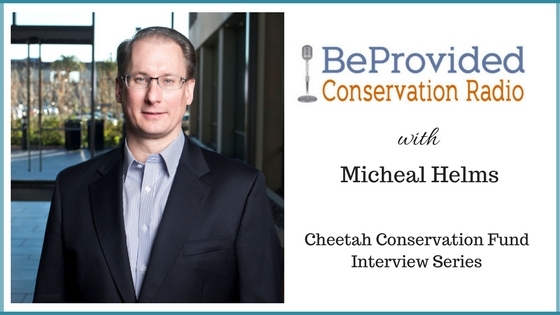 This interview has helped me gain a better understanding of what goes into and what needs to be done for conservation of eco systems and wildlife. Mike is a biochemist by training and has spent 10 years in the biotech industry in the SF Bay Area and 8 years at the Stanford University School of Medicine. More importantly, he is an avid traveler and conservationist, with a special interest in cats. He and his wife, Shinae, met Laurie Marker in the early 2000s and visited CCF Namibia in 2006. While there, they discussed CCF's needs, one of which was genetic sequencing. Mike had connections with Applied Biosystems in Foster City, CA, where he and his wife also lived at that time. Applied Biosystems is one of the companies that makes genetic sequencers. Working though his connections over the next few years, he and others were able to negotiate a donation of a genetic sequencer, supplies, and ongoing support to CCF Namibia. A few years later, the same company donated another, higher capacity genetic analyzer, because to their surprise the other one was getting used rather frequently. The relationship has been very productive for all parties.